The injectors are first visually inspected then checked for coil winding shorts or opens. A number is now engraved on them. 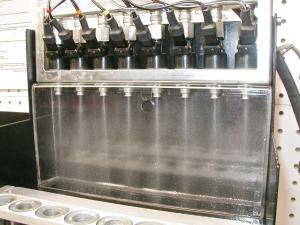 The exterior is cleaned in a parts washer using filtered mineral spirits to remove any dirt, grease or other foreign matter that may contaminate the cleaning and flow testing solutions. 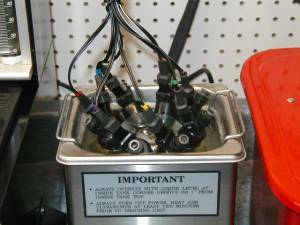 On metal body top feed injectors, we bead blast the exterior to remove the paint and rust. After the initial exterior cleaning, the part are inspected then coil winding resistance measured and recorded. 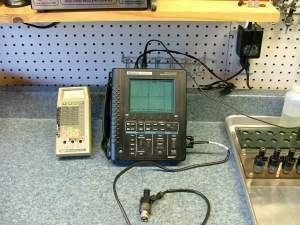 A scope is used to observe the coil current waveform. 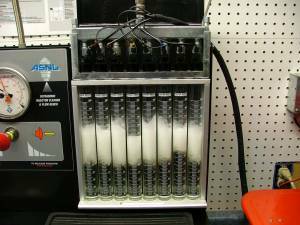 The injectors are placed on our modified ASNU Fuel injector machine or our custom flow tester depending on the size and type of injector. These will be tested on the ASNU. They are now leak tested at various pressures and the spray patterns checked. This is where the actual flows are measured. 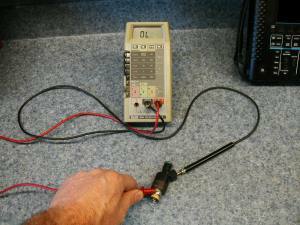 Both static (wide open) and dynamic (pulsed) tests are performed, these results are recorded. 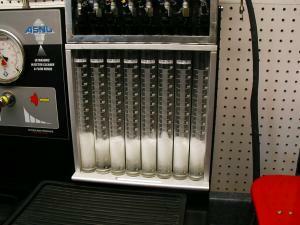 Pulsed flow testing is very important since it is how the injector will be operating in the vehicle. 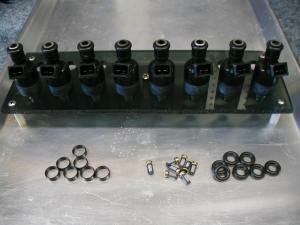 The parts are now disassembled by removing the pintle cap, o-rings, filters, and spacers. Now back to the parts washer to clean the areas now exposed. 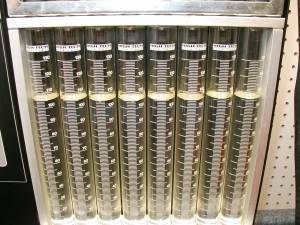 The injectors a placed in the first (of three) ultrasonic cleaning tanks. 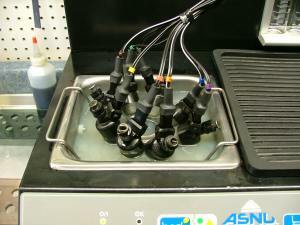 This first step is to clean the bottom and the exterior of the injectors. 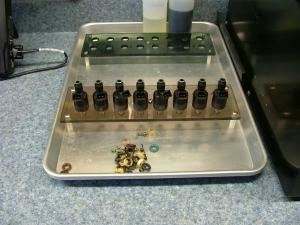 This step prevents the contamination of the cleaning solution in the next steps. They are now put in the second heated ultrasonic tank for cleaning, leads are connected to pulse them on and off during this operation. They will go through one or more cycles depending on the results of the first flow test. 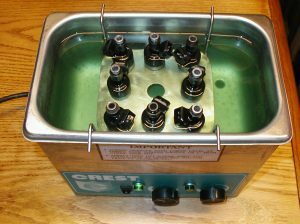 The injectors are now moved to a third ultrasonic cleaning tank whose cleaning fluid is kept extremely clean and the cleaning continues. Once again they are pulsed. 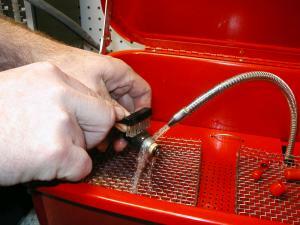 This three tank cleaning process assures that the injectors are as clean as possible. Back to the ASNU machine for a second round of both static and dynamic flow testing. Results are again recorded. If any do not flow as expected, they will be cleaned again in the tank and retested. After the foam settles, the results can be seen, these flowed to within 1%. Any remaining replaceable parts, such as spacers and filters are now installed. The cleaned injectors and placed in numbered plastic bags. 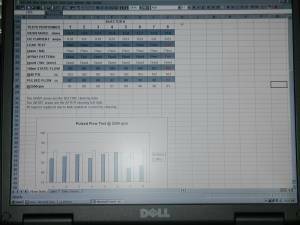 An Excel test report is prepared showing both the before and after flow data. Click here to see an example of a test report. Everything is carefully packed and ready to ship.